LeBron James has finally got got his fill after he and the Miami Heat closed out their Eastern Conference semi-finals series against the veteran Boston Celtics. 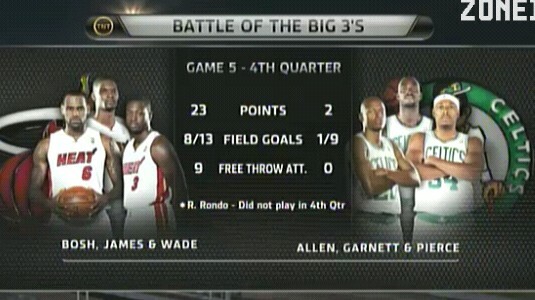 Heat's Big Three outclassed that of the Celtics'. Look at the picture above. Wade scored 34 points and LeBron James added 33 points in this come from behind win. The score was 97-87. They are now in the Eastern Conference Finals. They will either face the Chicago Bulls of the Atlanta Hawks. The Celtics were up by 7 points in the last 5 minutes of the 4th quarter but LeBron James was awaken he had a 10 point spread all in a short time. He had 5 three-point shots in the fourth quarter. They had a 16 to nothing run against the Celtics in the latter part of this game and that's why they win this series. James showed his heart in this game. He's the king of the jungle! Jermaine Oneal's back went bad and Rondo's elbow was dislocated. These figures symbolizes how Boston came to this point. They scratched their butts off just to be in the semis. I will give all the credits to them. They deserve it. Here's the replay of the video highlights of Game 5 between the Celtics and the Heat.